The TICS TFS Plugin provides a build step that invokes TICS. This build step can be added to any build definition. Using the plugin requires installing it into your instance of Team Foundation Server. Only fully updated versions of TFS 2017 and TFS 2018 are supported. Follow the steps below to download and install the plugin in TFS. Go to the TICS download site and download the latest available version of the plugin (.vsix extension). Click to download. In Team Foundation Server, go to Browse TFS extensions via the Marketplace icon in the top-right corner. 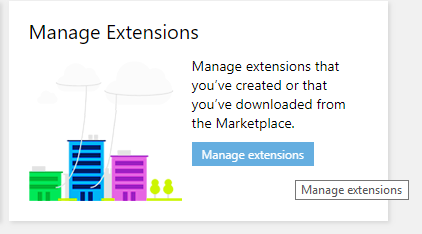 Scroll down to find the Manage extensions button. Click the Upload new extension button and upload the file you downloaded earlier. The plugin should be listed in the list of extensions now. Click the install button to install it to a team project collection. You need to have TICS installed on the machine (agent) on which you want to run the job. Provide the required settings. Click the information icon for each option to get help. More advanced options become available when you expand the "Advanced" category. Save the settings and choose Queue new build to execute the job.